Competition is fierce among financial planners, investment firms and banks. When it comes to choosing a partner for their money, many people look beyond which institution offers the best interest rates and/or investment returns and look for financial partners that share the same social and environmental values. In the past, people have chosen credit unions, community banks and local financial planners over the world’s biggest institutions. Now, there are even more alternative choices from impact-driven banks to Certified B-Corps. The Global Alliance for Banking on Values is an independent network of banks using finance to deliver sustainable development for under-served people, communities and the environment. In addition to offering FDIC-insured banking services, the network’s members have “a shared mission to use finance to deliver sustainable economic, social and environmental development, with a focus on helping individuals fulfill their potential and build stronger communities.” Many GABV members are also certified B-Corps which means businesses have met the highest standards of verified social and environmental performance, public transparency, and legal accountability to balance profit and purpose. If you are a part of a financial institution or firm that focuses on the triple bottom line, you need to set your business apart from the largest banks and brokerage firms to be more relevant to your local communities while keeping with your company’s mission and values. Purpose-driven banks and local financial planners want to identify with their local community and customer base. One way to do this is to make sure promotional products speak to your organization’s sustainable mission. 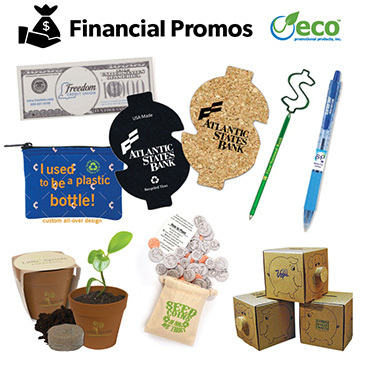 Whether you want a giveaway to send home with potential customers or you are exhibiting at a tradeshow or a community event, there are many eco-friendly promotional products with a financial theme. Following are 5 affordable promotional products that promote eco-friendly banking/investments and will help grow your business. Pens: A staple in financial offices, customers will appreciate branded eco-friendly pens. The popular Pilot B2P pen is not only a high-quality writing instrument; it also comes with stock art showing the pen is made from recycled water bottles. For children’s banking programs, participants will enjoy receiving a recycled pen with a dollar shape on the tip. Dollar Themed Products: Recycled tire jar openers and cork coasters in the shape of a dollar sign are a low-cost giveaway that will be used time and time again. Seeded Items: Planter kits or items made from plantable seed paper are ideal vehicles for “Growing your Money” messaging. These products are fun for all ages. Piggy Banks: Made in the USA from recycled cardboard, children will love custom piggy banks. Perfect for children’s banking programs or certified financial planners working with young families. Wallets: Fully customizable, zippered wallets are made from high density recycled; open-cell scuba foam which is made from 85% recycled plastic PET bottles. This wallet will be sure to be a unique conversation piece. Mighty, Global Alliance for Banking on Values and BCorp are three sites to learn more about purpose driven banks, financial planners and investment firms.